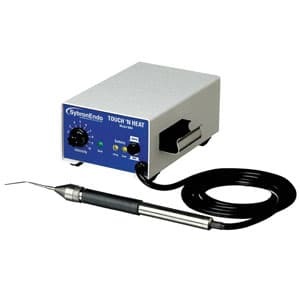 The Touch ’n Heat 5004 is manufactured by SybronEndo, a company that specialises in endodontic instruments. This small and manoeuvrable handpiece is used to melt excess gutta percha once you have completed a root canal. The traditional method for removing excess gutta percha was to heat a metal instrument over a bunsen burner, carry it over to the patient and use it to tidy up the root canal. Not surprisingly some patients found this to be a quite a scary process. The Touch ’n Heat is so much more convenient. There’s no mucking around, no open flame and the perception for patients is much better. The instrument has a very small tip so the heat stays localised to that area. There are similar instruments to this on the market but they are all quite high tech. Most of them offer the option to dial up the amount of heat. The operator can set it anywhere on a temperature gradient from 180 degrees up to 220 degrees. The drawback of these other units is that they are larger and much more expensive. What I particularly like about the Touch ’n Heat is that it’s probably the smallest, cheapest version of these types of devices and yet it does the job easily and efficiently. The only drawback is that after continuous use, the tip tends to discolour and bend. You need to replace the tip about every six months or so. Bite Magazine and website is published by Engage Media all material is protected by copyright and may not be reproduced in any form without prior written permission.